By mobilizing volunteers and community partners, Habitat for Humanity Lundar works with people from all walks of life to build safe, decent, affordable housing for purchase by low-income working families. To provide families with a foundation for positive change through affordable housing. Success through collaboration: Working with all of our partners to improve the quality of life through access to affordable housing. Integrity: Inspiring hope through openness, respect, trust, fairness, patience and honesty. Honour: We embrace our heritage while building our future. 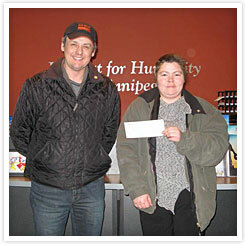 Lundar, Mb, December 19, 2011 – Lundar has joined the international movement to help local families in need of safe, decent, affordable housing by forming a Lundar Chapter of Habitat for Humanity Winnipeg (HFHW). A steering committee was formed and the local group intends to build its first home in 2013. When an organization like Habitat for Humanity comes in, it gives us a different profile. Habitat for Humanity is known world-wide, for the good work they do and it puts us on the map when it comes to having a social conscience. As a Chapter of HFHW, support is provided to Habitat for Humanity Lundar (HFHL) by the affiliate, which will also carry the liability and mortgage. Mortgage payments are calculated at 25 per cent of a HFHL homeowner’s annual income and there is no interest charged or down payment required. As part of their commitment to Habitat, the family is required to put sweat equity of up to 500 hours into the project. Sweat equity will consist of actually swinging a hammer and working on community projects approved by the Chapter. A family pays fair market value for their home. HFHL will build it with as much donated labour and materials as possible, but the selling price of the house will be set according to fair market value and mortgaged accordingly. The family is not getting the home at cost nor is it a free home giveaway program. All mortgage payments made by Lundar Chapter homeowners will be placed in an account with HFHL. This is a revolving account and the funds will be used for future projects, in addition to funds raised through local donations. The house will be chosen from a catalogue of plans, provided by HFHW and there are requirements the home be built to Manitoba Hydro’s Power Smart Gold Level. The local steering committee determines where the house will be built and will manage the construction. There is provincial government support available for Habitat Chapters across the province and Manitoba Lotteries Corporation supports HFHW Chapters with up to $25,000 per project on a matched grant basis. Community involvement is part of the mandate of Habitat for Humanity. Supporting Habitat Lundar creates a tremendous feeling people want to be involved in. It is a hands on thing. This is helping our neighbours and helping families..
Habitat for Humanity Lundar is an officially designated chapter of Habitat for Humanity Winnipeg. Habitat for Humanity Winnipeg is a registered charity and affiliate of the international non-profit registered charity committed to eliminating poverty housing and dedicated to making safe, decent and affordable housing for purchase by low-income working families.